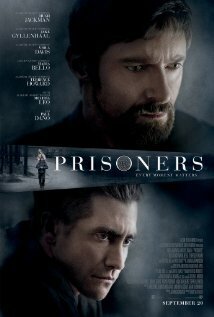 Over the weekend I decided to pop into the movies again, this time I went to see Prisoners. The moment I saw this trailer I knew it had potential to be a great movie. The cast is star-studded with Hugh Jackman, Jake Gyllenhaal, Terrence Howard and Maria Bello. Well with all that being said lets dive right into the 9 things I liked and didn’t like about Prisoners. Plot: When Keller Dover’s daughter and her friend go missing, he takes matters into his own hands as the police pursue leads and the pressures mounts. Just how far will this desperate father go to protect his family? 1. Denis Villeneuve was the director of this film and I had previously never even heard of the guy, which was kind of scary because this movie looked good but the thought of a director whose never really done a big style film was concerning. But Villeneuve nailed it; from start to finish he kept you on the edge of your seat and kept you guessing throughout the movie. The pain and anguish you felt for this family was heartbreaking, you couldn’t help but want to see this family get his retribution. 2. This movie had a great story (Aaron Guzikowski penned this). They made you care about the characters, they didn’t make you feel dumb by any means and they even got you to feel for Alex Jones (Paul Dano) which that in itself was amazing. Guzikowski has a sick mind for sure to write this movie but the writing on this was just brilliant and the fact that Villeneuve was able to translate that to the big screen so well was great. 3. Hugh Jackman: It doesn’t get bigger than Jackman. He is a star and he showed why in this movie. He played an intense, caring and fight to the death father that just wanted his daughter back. You slowly watch Keller Dover (Jackman) transform from a concerned father into a guy that was willing to do anything to find his daughter. A lot of people said “Oscar talk” before this and I was like that is a big statement to make but as of right now Jackman has to be a front-runner for Best Actor. 4. Jake Gyllenhaal: Jake is easily one of my favorite actors, he has played in some really god movies over the past few years (End of Watch, Source Code & Brothers). He rivaled Jackman with his performance in this. He played Detective Loki, who was in charge of finding these little girls and knocked it out of the park. 5. Paul Dano: Dano was on the big screen with some big stars in this and held his own just fine. The way he portrayed Alex Jones, a timid scared and very creepy adult that wasn’t all there, he nailed it. His character was written so well that you couldn’t help but feel for him towards the end of the film. 6. The rest of the cast: Terrence Howard, Maria Bello, Viola Davis & others. Perfect casting for this film, Howard was great for this role and was interesting to see his character (Franklin Birch) turn into the guy that Kellen Dover wanted him to be and not who he thought he should be. Viola Davis didn’t have too much screen time but one scene in particular she was amazing. I won’t spoil it, you will just know whenever you see it. I think the Grace Dover character was made for Maria Bello and nobody else. A movie is only as good as its cast and this showed it. 7. The emotion: I am a huge movie guy and will give just about any movie at least one shot. But the bad thing is seeing so many movies you find it hard to care about characters. Only really good movies get me to care and this was one of them. I was emotionally invested into each role; though it was a tad long they still kept the movie going at a steady pace. Whether it was Dover (Jackman) just beating Jones (Dano) into a bloody pulp or Grace (Bello) just crawled into a ball on a bed crying missing her kid, you felt what they felt. That is what makes a great movie and boy was this a damn good movie. 8. Kept you guessing: I love a movie where you sit through the movie and just keep trying to guess who is the killer or who is this or that. This was that movie; I was sitting there next to my brother and just trying to figure out where they were going with the movie. I would think it was going to go right and they hooked a left 4 streets before that right. They led you to believe many different things and none of which really came to fruition. 9. The payoff: I refuse to spoil any of the ending for you guys but what a freaking ending. (That is all I will say about that) If you have seen this movie, please leave a comment below on your thoughts on the ending. Would love to hear what people thought of it. Villeneuve & Guzikowski teamed up to bring what I think is a top 5 movie of the year so far, actually might be the best movie I’ve seen this year. Just a fun thrilling ride start to finish that keeps you guessing at every turn. Two Oscar worthy performances by Jackman and Gyllenhaal, a supporting cast and an amazing movie that will keep you talking about it for days.